Make “Basic Pasta Dough” (1) and then let rest for at least 30 minutes while you make the filling. Wash the spinach. Wilt in a pan or blanch it. Then squeeze it dry and chop. (2) Place the spinach into a bowl and set aside. Finely mince the garlic and add to the spinach. Then grate the cheese and finely chop the parsley. Add to the spinach mixture, along with the egg and seasonings. With a fork, mix to evenly combine. Place into the refrigerator while you roll out the pasta. 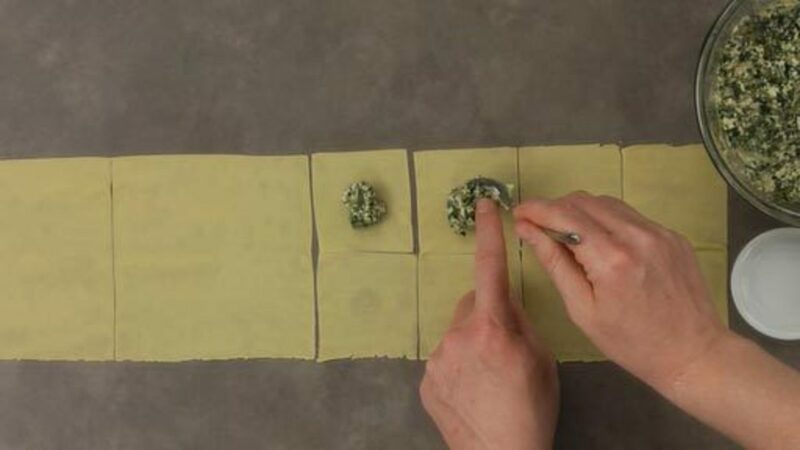 Once the dough has rested, roll out into sheets (roll upto the second-to-last setting on the pasta machine). As you roll out the sheets, cover with plastic wrap so they don’t dry out. 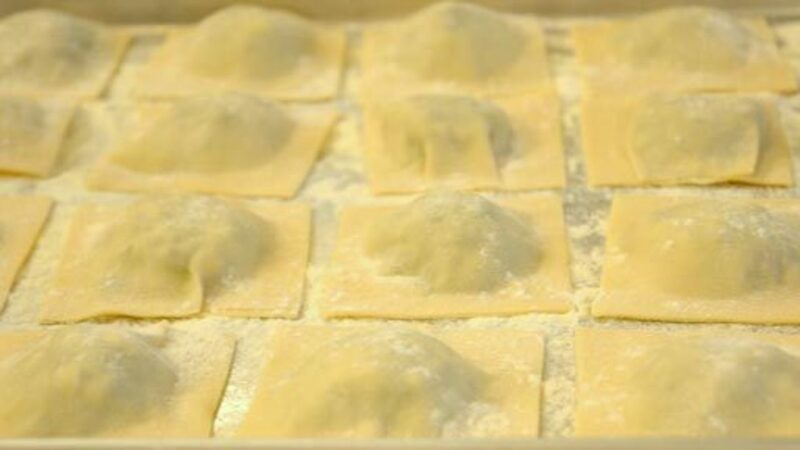 To fill the pasta, cut about half of the sheet of dough into 2"- to 3" -inch squares. Brush the edges with a bit of water, and then place about 1 teaspoon or so of filing into the center of each square. Once done, loosely place the remaining sheet of dough over top. Press to seal, then cut around the edges. To finish, make sure the edges are tightly sealed, so no filling escapes during cooking. Cook immediately or place into the refrigerator. You can also freeze them for up to one month. NOTE: If you are making the ravioli to serve immediately, place a pot of cold water on to boil before you start filling the pasta. To cook the ravioli, make sure the water is at a boil and then add the salt and stir. Just before you add the ravioli, turn down the heat slightly, so the water is just at a gentle boil. Add the pasta and gently stir. Let cook for approximately 6 minutes, or until the edges of the pasta are tender, but still firm to the bite. Drain and serve with your favorite sauce. 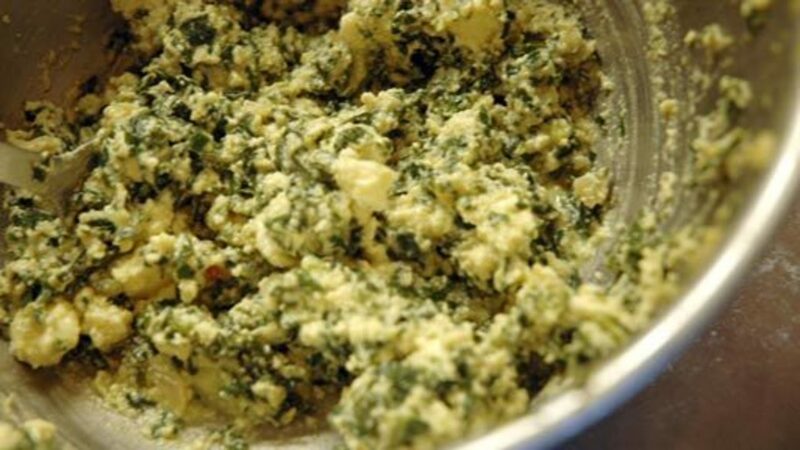 (2) See Step 1 “”/recipes/1130">Preparing the Spinach" from Mario Batali’s Basic Pasta Dough for blanching instructions. I made the basic pasta and the spinach-ricotta ravioli filling. I then rolled the fillling in the raw dough. My question is, how long do I bake it? I am going to put tomatoe sauce over it before baking. Please help. My email is scubapudgy@yahoo.com if you need it. Thanks for your time and assistance. Cannelloni is generally baked for about 25 minutes or until completely heated through; however, because you have raw noodles, this will take a bit longer. Also, make sure to add some tomato sauce to the bottom of the dish as well to prevent sticking. Again, because you are using raw noodles, you'll need to use enough sauce for the noodles to cook in. 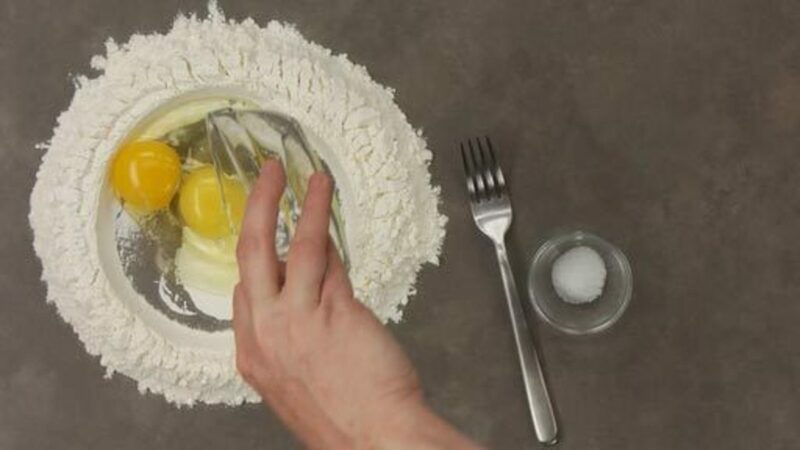 Ideally, next time you make any pasta dish that you plan to bake, it is best to pre-cook the noodles before assembling. This prevents the noodles from potentially becoming gummy. Cheers! Hi, I made this the other day using my kitchen aid pasta roller attachment to roll out the pasta sheets. When I was down to the second to last setting I was looking at paper thin pasta. when I put together the raviolis I could see through the top layer and see all the detail of the filling through the pasta. Not exactly like what it looks like in the video. They were so delicate, many broke before making it to the water. I think the Kitchen Aide may not directly correlate to the pasta machine you use in the video. Does anyone know what settings I should use instead? The thickness of the dough is definitely a personal preference . It's hard to say exactly which setting you should end on because each type of machine can produce different results. This is where practice definitely comes into play so you become well acquainted with your machine. The next time, stop at the 3rd last setting and determine if the thickness works for you. You could even fill a tester piece and cook it to see if you are happy with the results before rolling the dough further. Cheers! The best way to truly know if one method is better than another is to test if for yourself. I know this may not be the answer you are looking for but really this is the only way to tell if one method is really better than another. 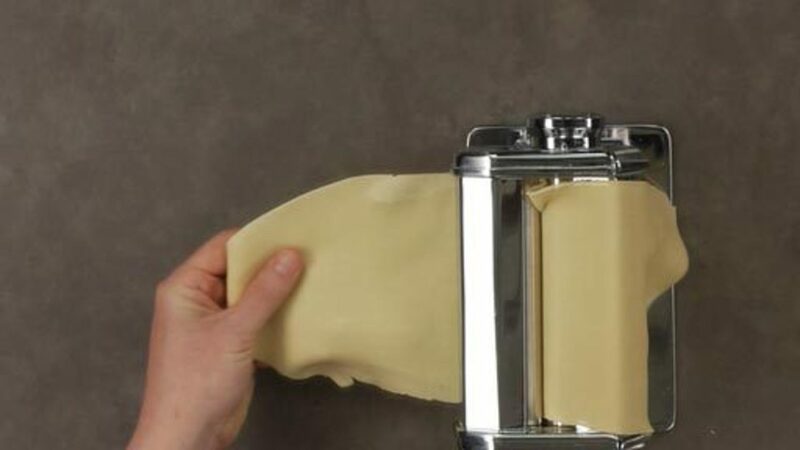 If I were to say that doing it by hand is the best way as it makes for more delicate pasta or that it will give you a better sense of what the dough is doing as you will be able to really feel it and see it for yourself, if I were to say all that it would all just be me telling you what I think. When really either method will work but it just comes down to whether or not YOU can tell a difference between the two methods. I will say that doing things by hand, at least at first, is a great idea, as it will give you a better sense of what you are doing and what you are looking for. Hope this helps. Cheers! Just as an update for any one who might run into this in the future, I made it again today and only went up to 6 on the kitchen aid. Worked out wonderfully. Looked much more like the video. Is there a common substitute for Ricotta? Hubby is allergic to ricotta, although other cheeses are fine. I made a spinach pasta that tasted very good fresh and I had lots extra so I dehydrated it for later. Any idea how much fresh herbs should be added? I added parmasan to my mixture but it was a little prone to ripping, perhaps I didn't let my gluten develop enough, or the texture of the cheese was separating the dough. I did add parmasan to the top of the pasta, and it seems better suited there ;) I look forward to making ravioli and my own cannelloni soon! Thanks! You might find it useful to bookmark this site for food substitutions. Regarding the herbs, it's really up to you and how much of a pronounced flavor you want in the dish. Yes, parmesan is better suited on top of the dish rather than in the dough as you will encounter these types of problems when working with it. Cheers! Thanks so much! We actually substitute a great deal - we are learning but this will be a great help! Appreciate all of the support. Nice receipy. Worked well with Canaloni tubes. Mine were Over Ready! but said I still need to cook for a full 1 hour. I used diced tomatoes in the cook pot to provide liquid to the Canaloni. I made Spinach-Ricotta Ravioli for dinner tonight with some pasta dough that I had left over from the linguini I made last night. :-) Now, you must understand how much I detest cooked spinach... BUT, I had spinach in the pasta dough, and spinach in the the ravioli filling.. which gave me this very pleasant soft green dinner.. especially when I added pesto on top. Oh my it was good. Probably the first time in my life that I have ever eaten 2 cups of spinach in one meal and actually enjoyed it!! My mom would have been proud! I am going to make up some Ravioli and Cannelloni using fresh pasta dough and the filling in this recipe. I'd like to freeze them. Could you tell me how I would cook each of these from frozen? I understand with the Cannelloni that I would cook them in the oven with a layer of tomato sauce on the bottom of the baking dish and on top of the noodles. I just need oven temperature, approximate cooking time and whether or not I would thaw the Cannelloni before cooking and any other advice you might have. Also, when cooking the ravioli from frozen, would I put the frozen noodles straight into the lightly boiling water and approximately how long would I cook them for? Hope this isn't too confusing. Thanks for your help! Firstly, remember that fresh pasta cooks very quickly. Cooking from frozen will only add a few seconds to the cooking process, as long as you use sufficient water/heat so the frozen pasta doesn't cool the water too much. 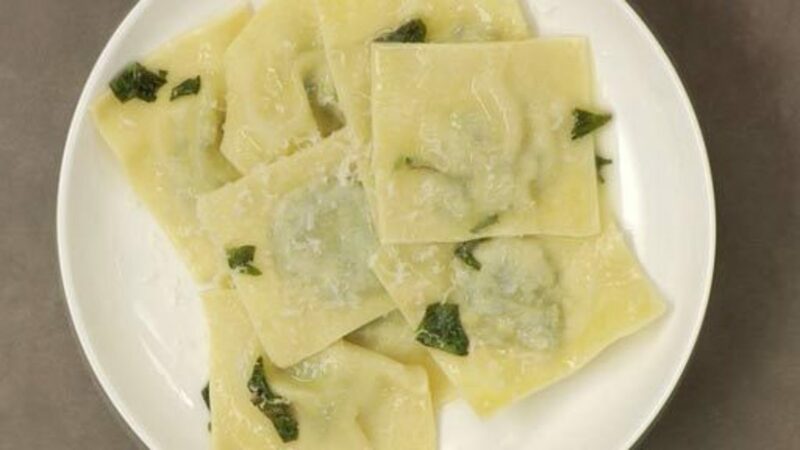 RAVIOLI from frozen: First of all, make sure to freeze the ravioli as individual packets so they don't get lumped together into one frozen bunch. Then there is no need to thaw. Cooking from frozen will help keep the ravioli from falling apart in the water, while keeping them separated from each other. You'll want to use lots of rapidly boiling salted water so the addition of frozen ravioli doesn't cool the water substantially.. Once the water returns to boiling, reduce the heat, set your timer and gently boil as stated in the recipe: "Let cook for approximately 6 minutes, or until the edges of the pasta are tender, but still firm to the bite." CANNELLONI from frozen: I've never made this recipe from frozen, but can offer some suggestions based on my experience with seafood cannelloni. (Which I make all the time): BTW. As opposed to ravioli, your cannelloni pasta should be cooked prior to forming into tubes and adding the filling. It is at this point that you can freeze, if desired. I bake my seafood cannelloni covered with tin foil, at 375F for 20-25 minutes if freshly made. If from frozen I add about 5 minutes. More important than "timing" is knowing what signs to look for. When done, the sauce should be bubbling. To test filling for doneness, insert a metal skewer into a cannelloni and hold it there 5 seconds. Remove skewer and press it against your bottom lip: If metal is warm, the filling is cooked and you are done. You will need to adjust my times based on the fact that your filling is different, and you are using a tomato-based sauce. (I use a bechamel) You really can't go wrong with the spinach-ricotta mixture, since everything except the egg is already cooked. You are really just heating to melt the ricotta and blend the flavours. Leigh, thanks so much for all the great information. It's so nice to be able to tap into the experience of others who have already "been there and done that". I will definitely follow your advice! Cheers.